How much water is in the atmosphere? 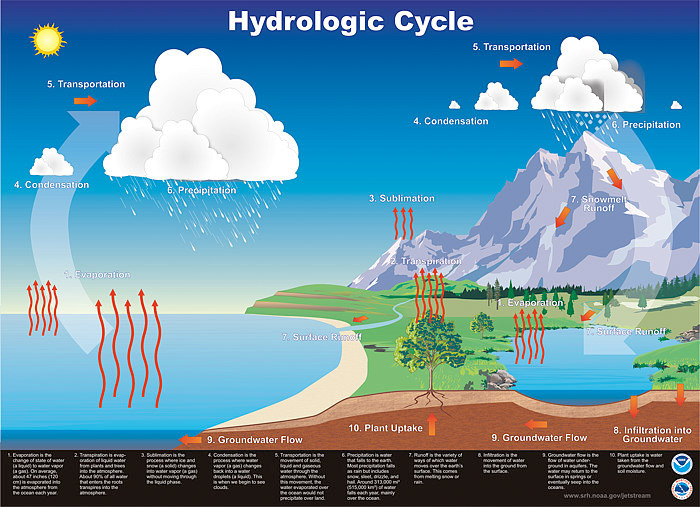 Water is an exceptionally interesting chemical with many important implications for life on Earth and the circulation of the atmosphere. It is the only chemical that naturally exists in all three phases (solid, liquid, and gas) in our atmosphere. What’s more, this amount of water is recycled 40 times each year in what is known as the hydrological cycle. That means a water vapor molecule has an average residence time in the atmosphere of only nine days: the raindrop that fell on your head last Tuesday on average had evaporated into the atmosphere nine days before. This huge amount of water is processed through an endless cycle of evaporation, condensation, and precipitation all over the globe. Evaporating water requires energy – in fact, it takes 600 calories of energy to evaporate each gram. When that gram of water condenses back into liquid, that same amount of energy is released back into the atmosphere. The amount of energy released as 37.5 million billion gallons of water condenses would be enough to power the Madison, Wis., metro area for 144.5 million years! Think about that the next time you get caught in a spring rain shower!